A nice little snowfall on the Oberon Plateau on Sunday and a few of those flakes filtered across to the Blue Mountains as well. This system was particularly cold throughout the layers with ACCESS-R and GFs modelling both showing the temperature at 500hPa as being below -30C. The mid levels and lower levels were quite cold, too. There was some light snow on the Oberon Plateau on Sunday morning then as the next wave of cold air moved in during the afternoon, the snow got heavier. By traditional standards, it was a light fall of perhaps 3cm to 5cm but still plenty of fun. I was out there on Sunday afternoon at Shooters Hill and the snow was so fluffy and dry due to the cold atmosphere. Sadly, it wasn't a very moist environment during this cold change and the snow soon gave way to cold, dry winds. There was not strong, productive low pressure system or trough in our vicinity and this absence was the main reason we saw little snow in the mountains. Blackheath only observed light snow flurries and the odd snow shower on Sunday afternoon. A nice, light and fairly brief little fall of snow on Sunday for the Oberon Plateau - and the Blue Mountains above 1000M picked up some of the leftovers. The highest parts of the Oberon Plateau had a few cm of lovely snow that was a little drier than other falls this year, due to the colder lower levels at 850hPa. Snow showers were probably occuring in the very early hours of Sunday morning on the OP then by 6:30 Blackheath had lovely snow showers for about twenty five minutes. As the showers moved in from the SW, it was mostly the southern part of Blackheath that observed snow as the precipitation trigger in that part of town (Whitley Park hill) notably helps snow occur during marginal conditions. Northern and eastern areas of town can actually largely miss out during such marginal outbreak for moisture. The atmosphere as a general observation was not overly cold (about -25C at 500hPa, -10C at 700hPa) but thankfully the lower levels at 850hPa were just that little bit colder during this event (around -2C) so this allowed snowflakes to hold their integrity a little better and arrive as nice, fluffy flakes. This cold change was never going to be a powerful frontal system. However, it did bring some very welcome rain with some areas on the Oberon Plateau seeing around 20mm or even more, on the Monday. During early Tuesday morning at around day-break, light snow started to fall on the Oberon Plateau with up to a few cm of accumulation across the higher areas. The upper mountains observed snow showers and flurries above 950 metres at times on Tuesday morning and some of the falls were very pretty indeed. Blackheath even had a very brief settling just after day-break but it soon melted in temperatures of around 1C. The Sydney weather balloon information shows this system as pretty benign in a air-mass context with the temperature being -22C at 500hPa, -9C at 700hPa, 0C at 850hPa. It may have become a little colder than that during the best of this system across the Oberon Plateau but still, those numbers are not very impressive. As always though, the snow was fun and hearing the delighted children at the local school in Blackheath was wonderful. Another fairly benign cold front moved in during Friday morning. Sleet was intense at Blayney (860M) at around 9am and snow was falling at Mt Lambie (at 1100M) by 10am. Blackheath saw light snow flurries throughout the day but no settling. The Oberon Plateau had a light settling to perhaps a few cm above 1200M. A fairly benign system by longer term standards but this cold front still delivered a light dusting of snow to the Oberon Plateau and Mt Canobolas and Sunny Corner - in the range of 1cm to 3cm. Blackheath had snow flurries through the day but it was never cold enough to settle. Even though the sleet and snow was typically falling at around 2C to 4C, the relative humidity was around 80%, so the classic evaporative cooling effect comes into play. Flakes that would otherwise melt in relatively mild conditions are able to survive their fall to the altitude of Blackheath (and even a few soggy bits and pieces to Wentworth Falls) due to the relatively dry air. It was very windy throughout this system and wind-chill overnight on Saturday and into Sunday the 8th was around -10C at times. So, not a very snowy system by any means but it sure was cold, with the temperature below 5C for most of Saturday the 7th and often closer to 3C or 2C during light showers. This system was notable for its coldness throughout the layers from 850hPa to 500hPa but not large amounts of moisture this far north. The Sydney weather balloon info for Sunday morning - approximate figures are: -33C at 500hPa, -11C at 700hPa and -2C at 850hPa.The Oberon Plateau saw snow falling by Saturday afternoon with a light settling. By Sunday morning, numerous places below 1000M also saw snow, like Dargan, Portland, Orange, Milthorpe and of course Oberon. The cover on the higher ground varied a little (not unusual during shower activity) and around 8cm was measured at Shooters Hill and a similar amount at Black Springs - both of these settlement locations are over 1200M. Blackheath had light sleet and snow showers late on Saturday and some light snow into Sunday morning where it settled briefly but only amounted to a dusting due to our rain/snow shadow effect to the east of the Oberon Plateau. Our best directions in the Blue Mountains for snow are from the south and south east and also when the frontal system has such strong instability that it can bring some snow from most directions. 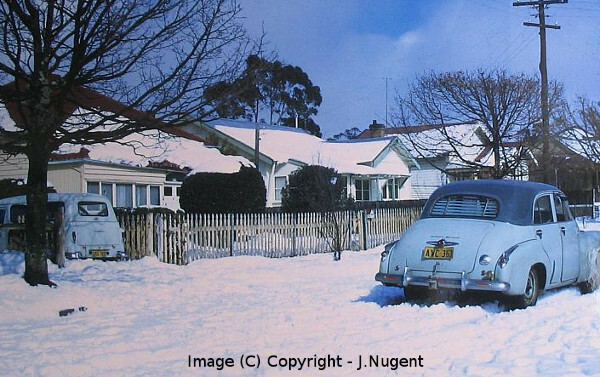 So, not a major snow event but a fun one, especially for those that visited the Oberon Plateau. I will add more to this report as time allows. A light snowfall occured on this day, Shooters Hill and places like Porters Retreat observed snow showers and a light settling. The Blue Mountains didn't see snow from this event. This system turned out to be cold throughout the layers of the atmosphere but lacked moisture. -32C at 500hPa, -12C at 700hPa and around -2C at 850hPa is a colder than average system for May. Thursday afternoon saw the first frontal band arrive at Shooters Hill at around 4pm. At 2pm it was around 12C out there and by 4:30pm it was 1C. Light snow occured at just after 4pm but did not settle. Overnight on Thursay the snow become heavier on the Oberon Plateau at times and by Friday there was a nice settling (a few cm) at Oberon township and even as far east as Hampton. Sunny Corner saw a nice settling to a few cm and even Lithgow township observed snow showers on Friday. Blackheath didn't really see anything more than snow showers at times on Friday morning. There was a lack of moisture over this way, as the system was drying out as it slid across the Oberon Plateau. Contrary to local lore, our lack of snow in Blackheath is not because it gets too windy but rather its a lack of moisture and sometimes a lack of surface level cold, that prevents us from seeing a good settling these days. I've seen many good settled falls on the Oberon Plateau during strong winds and also numerous good falls in Blackheath with winds of 100km/r and more. You can have snow not settling in light winds or strong winds and also snow settling well in strong winds or light winds. Its not the wind that is the problem, its the lack of low to mid level moisture and also our lack of significant, lower level cold, during cold fronts these days as well. In the old days, the Oberon Plateau may have seen falls of 15cm to 30cm in their bigger falls and we would see maybe 5cm to 10 across the upper Blue Mountains. These days, the OP more often sees 5cm to 10cm and the upper mountains sees snow showers and perhaps a light settling if we are lucky. Of course, bigger falls do occur across the Blue Mountains but much less often than they did in decades previous.